Changes in dental treatment technologies are bringing exciting changes to patients. One such technology is laser dentistry. Many patients have never heard of laser dentistry, but this approach offers a minimally invasive option for a wide range of dental treatments. A laser is an intensely focused beam of light. The light beam can change or remove small amounts of tissue. A dental laser can remove or reshape both hard tissues (like teeth and bone) and soft tissues like gums and palate tissues. The ability to target small amounts of tissue makes lasers ideal for dental treatments. Laser dentistry is ideal for patients who suffer from anxiety related to conventional dental treatments. Laser dentistry is virtually painless, bloodless and usually does not require anesthesia. It is also safe for pediatric dental procedures. Why Is Laser Dentistry Better? In short, laser dentistry allows dentists to provide better, more comfortable dental treatments to their patients. Dental lasers enable dentists to treat cavities quickly, so there’s no need to make additional appointments for most services. Unlike a dental drill, a dental laser does not vibrate at all. Patients don’t feel (or hear) the laser, and they don’t feel the discomfort that a dental drill may cause. Dental lasers are very precise. A laser allows the dentist to remove only the decayed portion of the tooth. This minimizes the size of the repair and preserves as much of the remaining healthy tooth as possible. Dental lasers provide an excellent treatment option for patients who have sensitive teeth. In addition, laser treatments significantly reduce the pain associated with conventional dental treatments. Many patients receive laser treatment with minimal or no anesthesia! 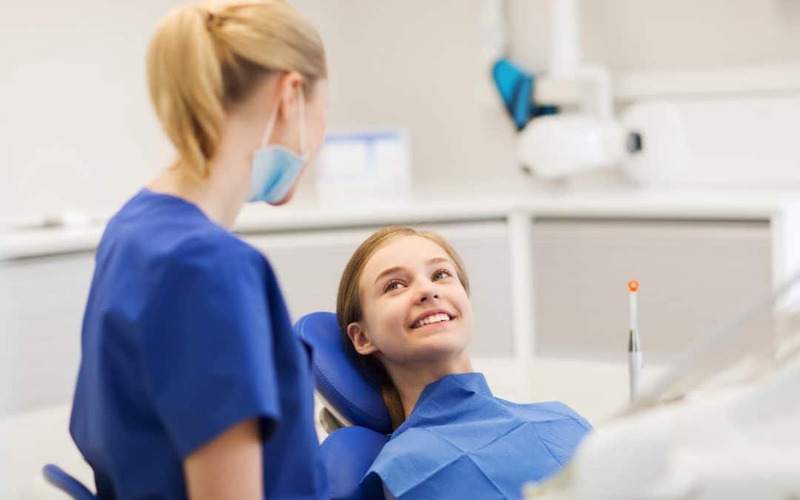 Reduced swelling and blood loss in soft tissue procedures mean that patients recover faster from dental treatments, feel better and can return to their daily activities immediately. In most cases, patients don’t require sutures following soft-tissue laser treatments. The laser sterilizes the surgical site during the procedure, which reduces the risk of infection. It also limits – and in many cases eliminates the need for sutures. This further reduces the risk of developing post-procedure infections. Dental lasers offer many advantages over conventional dental treatments. At Viewpoint Dentistry, we use the Solea CO2 laser. The Solea laser is the first dental laser designed to treat soft, hard and bone tissues. This versatility enables us to offer a complete range of pain-free dental treatments. Using the Solea laser, we can provide same-day fillings with absolutely no shots and eliminate the need for return appointments. Because we don’t need to use anesthesia, you can feel your new filling immediately and we can adjust it during your appointment. You can return to your activities immediately with no pain, no swelling and no discomfort! The Solea laser also allows us to offer a wide range of other preventative, restorative and cosmetic treatments. If you would like more information about our pain-free laser dentistry options, please call us at (509) 946-9313 to set up an appointment.